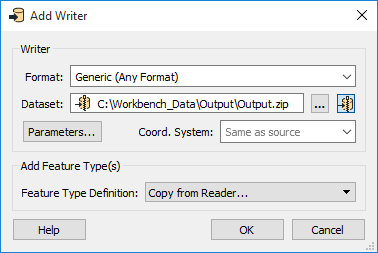 FME can write output datasets directly into a zip folder. This is useful for when the output needs to be compressed to a smaller storage size, or when a folder-based dataset (such as Esri Shapefile) is comprised of several files that need to be stored together. Defining a zipped output dataset is as simple as setting a .zip extension in the output dataset name. For convenience, when the chosen format supports this feature, a Zip button is displayed beside the Dataset parameter. The Zip button automatically adds the .zip extension to the Dataset parameter. Locate and double-click the Destination dataset parameter in the Navigator window. Formats that support multiple file extensions may require that you specify a file extension following the zip filename. For example, in a zipped AutoCAD writer, Workbench will default to creating .dwg datasets inside the zip file. To write .dxf files instead, enter filename.zip\filename.dxf as the Dataset parameter. 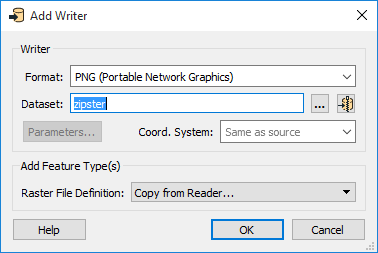 The Generic Writer integrates with zip writing by creating a zip file that contains any specified file/folder format. Dataset Fanout integrates with zip writing by allowing you to write multiple datasets to the same zip file. To create a fanned-out zip file, simply ensure that the Destination Fanout Directory parameter ends with the .zip file extension. Writing a password-protected zip file is not currently supported.